Pawpaw County, Indiana, is all atwitter about Ma and Peepaw Horton’s annual Chickenlandia Festival. The mood turns dark though when the Horton’s prize-winning rooster, Dewey, and his best laying hen, Ginger, vanish, leaving behind no clues except for a trail of tail feathers. Also missing: Gertie Wineagar, local sourpuss, and BBQ chicken cook-off queen. Odder still: the festival’s reigning chicken dance champion, Billy Bob Burris, is run down by a speeding pickup truck with suspicious out-of-state plates. Senior sleuths, and lifelong gal pals Ruby Jane Waskom and Veenie Goens suspect Hiram Krupsky, Pawpaw County’s self-proclaimed Chicken Wing King, of launching the crime spree in an attempt to sabotage the Horton’s free-range chicken ranch. The senior sleuths, who need a way to spy on Krupsky’s chicken empire, and search for clues, get an unexpected “in” when Hiram slips into his best leisure suit and commences to court Ruby Jane. 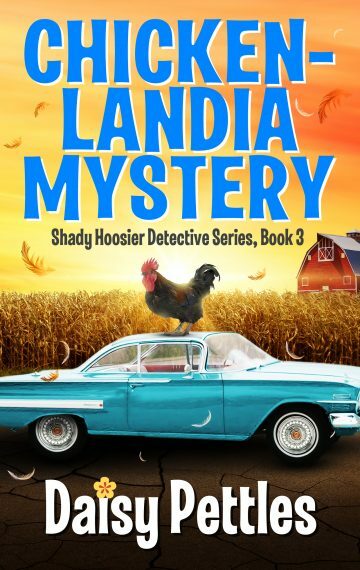 Follow the senior Hoosier snoops as they attempt to sort the good eggs from the bad in this hilarious small town comic crime mystery. COMING April 15, 2019 in print and ebook. You’ll get a first edition hot off the presses the first day of release. AND you won’t be charged until the book ships.